IMAP® technology provides a homogeneous assay applicable to a wide variety of kinases, phosphatases, and phosphodiesterases without regard for substrate peptide sequence. The assay is a simple mix-and-read procedure allowing accurate determination of enzyme activity. 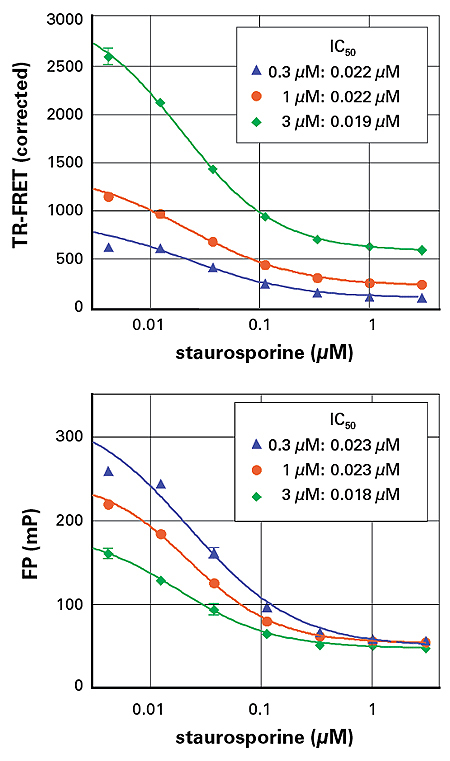 Based on the specific, high-affinity interaction of phospho groups with trivalent metal-containing nanoparticles (beads), IMAP is a generic, non-antibody-based platform to assess kinase, phosphatase, and phosphodiesterase activity. An enzyme reaction is performed using fluorescently labeled substrate. Addition of the IMAP Binding System stops the enzyme reaction and initiates binding of the beads to phosphorylated substrates. Binding of the substrate to the beads, which correlates to enzyme activity, can be detected using either FP or TR-FRET as a readout. IMAP Progressive Binding System lets researchers optimize their FP and TR-FRET assay conditions for each substrate used. The system consists of Progressive Binding Buffer A and Progressive Binding Buffer B, along with Progressive Binding Reagent. The two buffers and the reagent can be combined in different proportions according to the acidic character of the substrate choice, desirable ATP concentrations and background parameters. Molecular Devices offers a wide range of validated substrates and calibrators. Substrates may be used with the enzymes for which they were originally validated, or as potential substrates for other enzymes. Figure 1. IMAP principle using FP readout: Binding Solution is added after the kinase reaction using a fluorescently labeled peptide. The small phosphorylated fluorescent substrate binds to the large M(III)-based nanoparticles which reduces the rotational speed of the substrate and thus increases its polarization. Figure 2. IMAP principle using TR-FRET readout: Binding Solution is added after the kinase reaction using a fluorescently labeled peptide or protein. In this system, the nanoparticle is spiked with a Terbium (Tb)-Donor molecule. By binding to the spiked M(III)-based nanoparticles, the phosphorylated fluorescent substrate comes into close proximity with the Tb-Donor, which allows measurement of the TR-FRET between the Tb-Donor and the phosphorylated, fluorescent substrate. Figure 3. IMAP principle using FP readout: Binding Solution is added after the phosphodiesterase reaction using a fluorescently labeled substrate. The small phosphorylated fluorescent substrate binds to the large M(III)-based nanoparticles which reduces the rotational speed of the substrate and thus increases its polarization. Figure 4. IMAP principle using TR-FRET readout: Binding Solution is added after the phosphodiesterase reaction using a fluorescently labeled substrate. In this system, the nanoparticle is spiked with a Terbium (Tb)-Donor molecule. By binding to the spiked M(III)-based nanoparticles, the phosphorylated fluorescent substrate comes into close proximity with the Tb-Donor, which allows measurement of the TR-FRET between the Tb-Donor and the phosphorylated, fluorescent substrate.